Your Whidbey Island & Greater Seattle Source for Dry Salt Therapy - To help relieve Northwest climate conditions for better respiratory wellbeing. Dry Salt Therapy ~ Halotherapy ~ is a safe and effective way of using salt’s natural antibacterial, anti-inflammatory and super absorbent properties to provide relief for respiratory and skin conditions. Join the mobile movement! 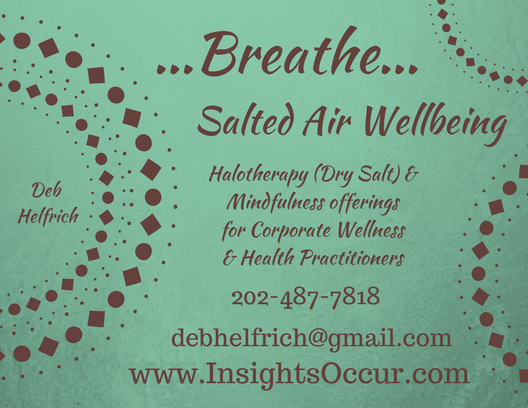 Salted Air Wellbeing Sessions available for businesses in the Seattle environs to offer the treasure of better breathing to their customers and employees. I provide on-site corporate sessions for employers invested in their employees ability to breathe and I also work with spas, wellness providers, yoga studios, and all healthcare practitioners to offer portable sessions demonstrating the healing potential of halotherapy to their valuable clients. I am proud to be using the best in breed equipment manufactured by Global Halotherapy Solutions. Contact me @ 818-900-2557 to discuss a time to setup some Halotherapy sessions in your venue. I'll just need an area around 9 feet square next to a standard outlet. Sessions are 20 minutes of sitting in the cabin, fully-dressed with up to 3 other people focusing on your breathing. You will be able to relax, read, listen to soothing music, or chat while inhaling micro-fine particles of salt. You may experience easing of congestion during the session but most people simply feel enhanced well-being & continue to notice the improvement as the day progresses as your lungs & skin make use of the salt absorbed over time. Depending on your results & conditions, you will likely want to book a series of treatments for optimal results. Looking to improve your own quality of life? I will be offering sessions for 1 to 4 people in the HaloCabin™ Air pictured above around the Whidbey Island and Greater Seattle area. Sign-up for our email updates to find a venue and time to try out the benefits of dry salt therapy on respiratory, skin, and Northwest climate-induced conditions. Sign up with your email address to receive news and event information on our Halotherapy Sessions. We respect your privacy. Your information will be solely used to send you useful information about our services & products. Thank you! Watch your email for information on our upcoming Halotherapy events. Sign up with your email address to receive news and updates from the unique perspective of Deb Helfrich. We respect your privacy. Your email will be used mindfully.